I’ve had an amazing week. 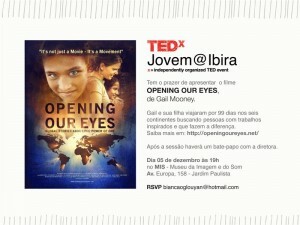 I’ve been in Sao Paulo, Brazil for the last few days to do a TEDx talk and to screen Opening Our Eyes. It has been a remarkable time, in many ways. As I listened to the many speakers of the day, talking about what they were doing in their life and in turn affecting other people’s lives, I couldn’t help but feel the common bond amongst this group. They were all thinking beyond themselves and that in itself was not only energizing but gave me great hope for the future. Most of the speakers were young – and it brought me back to when I was their age, so full of hope and believing that I could change the world. I suppose I am in the minority of people of my generation, because I’ve managed to hold on to those beliefs. If I hadn’t, I never would have embarked on this journey that I started with my daughter, almost two years ago. Yesterday evening I screened the film for many of the same people that had attended the TEDx conference. While I may be from a different generation and cultural background – we were kindred spirits in our beliefs, and our concern for others and the planet that we live on. It was the first time that I showed the film outside the United States and even though that was part of our dream – to take this film globally – I wasn’t quite sure how it would be received. But during the Q&A, I realized what I had probably known all along – that no matter how different our cultures may be in so many ways – we had the common bonds of what connects all humanity. We all need food and shelter and the obvious needs of life – but there is something more that all humans need – the need to love and be loved. The need to know that someone cares. I’ve been thinking about that a lot this morning and I think that even though my outlook has changed, I still basically remain the same person I have always been – meaning my fundamental character. I think what has really changed is that I’ve recognized the person who I have always been – and stopped living the dogma that others believe in. The funny thing is, the people who are in my life now, tell me how young and energetic I look and how happy and content I appear. I think what they see is what I am feeling on the inside. I also think that because of that, I am attracting people who are meant to be in my life. I’m no longer concerned about people who I thought I wanted or needed in my life, but might not have felt the same way. I only wish that I had learned this a long time ago. But as many of the wonderful people who appear in our film told us “there is a time for everything.” Thank you to all the beautiful people in Sao Paulo who have made this a very special and memorable experience. Our hearts will remain connected even though the miles may separate us. This entry was posted in People Making a Difference, Philanthropy, Social Media, Travel, Video and tagged around the world, Brazil, change, community, conference, cultures, discovery, documentary, exploration, extraordinary people, helping others, idea, ideas, inspiration, journey, making a difference, passion, People Making a Difference, philanthrophy, Sao Paulo, sharing, TEDx. Bookmark the permalink. It was wonderful to meet you and the rest of Tedx family in Sao Paulo. Your work inspired us .We hope we shall be in touchy so as to share more . I am Luyando’s father. Osward from Zambia. I so enjoy following the growth of Opening Our Eyes. Its amazing to have witnessed the project in the making and now see the completed vision spreading! Your dedication to your passion is so motivational. I had to stop watching the documentary the first time I played it because I couldn’t stop crying. I absolutely love it. Its beautiful, and I’ve watched it many times since. I wrote an article in my school newspaper about it under the Arts&Entertainment section. 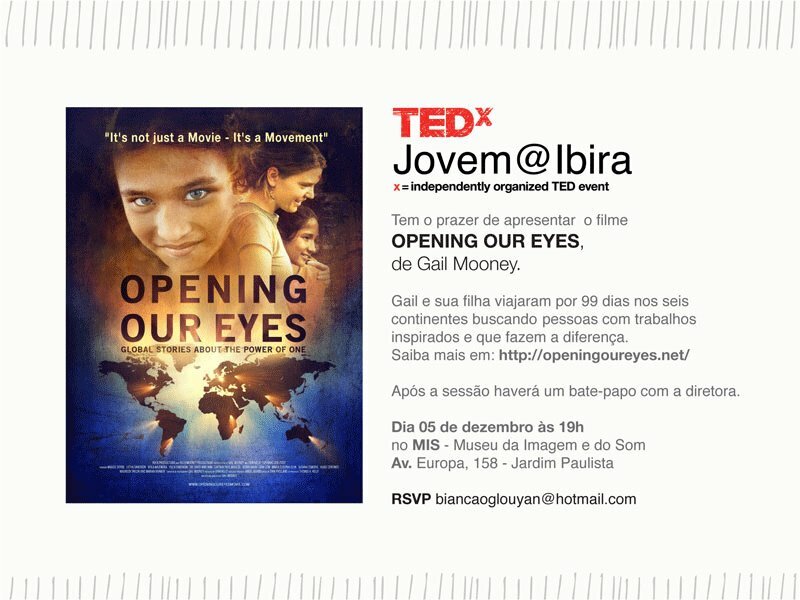 I titled the article, “Opening Our Eyes: More than a Movie, Its a Movement.” And they included a picture of the documentary cover and one from your website of you and Erin surrounded by a group of children. You inspire me to always be an active member of the legacy of people doing what they can to make the world a better place. Is there any way I can view your TED talk? I saw your post on Maggie’s facebook about doing one and I got so excited because I love TED talks, but I can’t track it down.